Please sign my Tripod Guest Book if you have not already done so! Thanks! "All work is as seed sown; it grows and spreads, and sows itself anew." 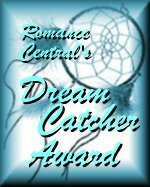 A special thank you to all who thought my page deserving of an award! Please visit their sites as they certainly exemplify "good-will" amongst all who attempt to create! Thanks to Allan at Allan's Eclectic Forum. Received on July 25, 1997 for my Shakespeare Section. Please visit Allan as he has a very informative section on the bard! Thanks to my friends at Chihuahua Pharoahs! Received on July 25, 1997. Please stop by and visit their remarkable pages! The Pharoahs tell me I am the first ever to win more than one of their awards-I am truly honored! Thanks to Windy Creek for this wonderful honor! Received on July 22, 1997 for my holiday pages! Awarded on June 28, 1997 for my 4th of July section. Thank you Sonja!! Thank you so much Cindy! Hugs!! I am pleased to tell you that your great site is being featured this week in the "Summer Reading for Kids" article at Parenting of K-6 Children at The Mining Company. The feature will run June 21-27, then will be placed in the Previous Features archive. I'd like to invite you to come on over and visit Parenting of K-6 Children to check out the feature. The link to "Summer Reading for Kids" is found on the Welcome page under "From Your Guide." You can see the site at the following address. Thanks for a great resource for parents! This is a very special gift from my great friend Janet. Visit her site at the Christian Home to Learn Web Site. I am a featured literature hot spot at the Franklin Institute! Thank you! Both awards received on June 21, 1997 from David at The Forum, for the Literature Nook. David has a splendid website on Rome-be sure to stop by! 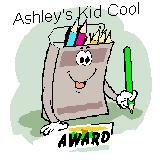 Awarded on June 18, 1997 for my holiday section on the 4th of July. Thanks so much Ron!! This award meant a lot to me!! The Gone With the Wind Page of the Literature Nook was awarded this beautiful award on June 13, 1997 by Annabella at At Home With Annabella. Annabella is from Rockingham, Western Australia and she has a lovely home page. Please stop by and say hi to her. She has an enchanting web site and a selection of gorgeous backgrounds! Thanks Diana! 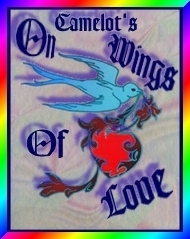 For your efforts in the promotion of art to children we indeed wish to honor you with the "Camelot's On Wings Of Love" award. 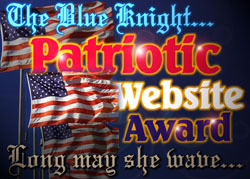 Know all ye this is not an award given for fast loading pages, outstanding graphics nor unique HTML coding. In essence this is no award at all -- rather we of Camelot wish to recognize and honor your participation in the constructive guidance of the world's children and the possibility of a brighter future for humanity. 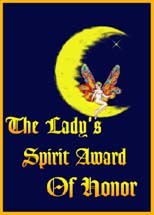 I am most proud of this honor and hope you will visit the Camelot site, where you will discover other sites dedicated to children and the arts! The Noel Family has a wonderful holiday page! Please visit them!! "That which cometh from the heart will go to the heart." Congratulations! Your site is being spotlighted today on CAT's Catnip of the Day for Sunday, December 15th. Read what she has to say! 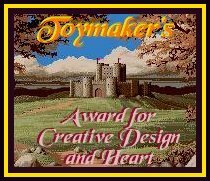 I received this award for my Christmas page located at my holiday web site There's No Place Like Home for the Holidays which features a monthly holiday focus. Please visit Lady Anita's beautiful page! Awarded December, 1996 for Holiday Pages. Please visit Jerry's site! It is really cool!! I am proud to be a member of Web Prestige. For yesterday is but a dream. Look well, therefore to this day." Thanks for stopping by! I am quite proud of this page and what it represents! Credits: Many of my graphics are from the MousePad.